This is not a true story, rather it is a story that has been imagined dozens of times. Because what is certain is that we achieved our goal, we travelled from Spain to Latvia to leave behind the entire output of our very special single. With Lunademayo, a graphic artist from Barcelona, I formed Slovenska Televiza, a cold-wave electronic band. The origin of all this adventure was a seemingly absurd idea that we decided to carry through to the end, to become an avant-garde artistic expression. First, we had to compose a song about Latvia, a country we had never visited, based entirely on our own imagination. Also, the lyrics would be in Latvian, a language that obviously neither of us speaks. Next, we would make a limited number of CDs containing that song, with the covers made by hand, one by one. 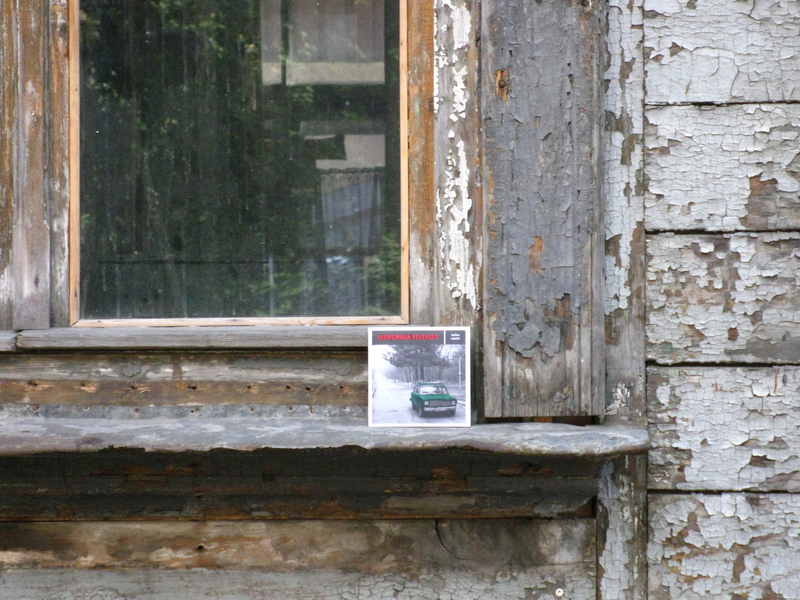 Finally, we would journey to Latvia, where we would abandon all of the CDs in various locations which would be chosen during our stay in Riga and its surroundings. And that’s exactly what we did. Coldwave is a genre of electronic music that often takes its inspiration from the period of the Cold War, so it is common to find references to oppressive, dark and cold environments that we interpret as stereotypes of the countries on the other side of the Iron Curtain. In Slovenska Televiza, although we do not depart from this trend, there is also a sincere desire to discover the historical and cultural realities of these countries, their present and their past. Because these were mostly stolen from us, on the one hand, by the unstoppable propaganda machinery of the USA, and on the other hand, by Soviet repression of any type of expression that supposedly deviated from official guidelines. The consequence of this politically bipolar world after the Second World War, was that paradoxically, several generations of European citizens are ignorant of neighbouring nations such as Poland – and, of course, of Latvia, Estonia and Lithuania. It was not until we arrived in Riga that we discovered Latvia’s traditional dainas, poetic-musical compositions of few verses. We were greatly surprised because our song had adopted precisely that same form. Somehow the mental connection we tried to establish with Latvia during the creative process in Spain had worked. We had a new daina, and a strange tingling in our bodies. The final phase of the project was undoubtedly the most emotional, but also the most complex. Contrary to what one may expect, it was not easy to walk the streets leaving behind our CDs. In fact, we took time to wander the streets and exchange opinions until we finally felt ready to start. So how to choose the right location? It can’t be just any place when what you have in your hands is such a personal object, so much so that it takes on emotions of its own. We decided that we should not wait around to see who collected the CDs. But then with each record we left behind, a part of ourselves was torn away. We experienced an intense sense of loss each time our steps led us away from one of them. As I said, it was a highly emotional experience, but once our fears were overcome, it gave us the opportunity to get to know this country in a deeper, more authentic manner. So we lived as true adventurers, as we explored the corridors and classrooms in the Academy of Arts, where all we did was draw the attention of Edgars, an old man, a lover of painting, who would often spend many idle hours there. With him I had a friendly chat that I will never forget. Or wandering around the spa resort of Krimulda Manor, awkwardly posing as guests. I still remember the tingling in the body at the possibility of being discovered and thrown out at any moment. The police appeared in Peitavas iela, a narrow street in the old town where the Jewish synagogue in Riga is located. Surely it was the security cameras that set alarm bells ringing when two individuals were spotted behaving in an unusual manner. When the patrol car turned the corner we squeezed up against the wall to give way, but they stopped a little further on. Trying to stay calm, the situation quickly become complicated, but we tried to act normal. We took some photos like a couple of vulgar tourists and then left; of course, leaving behind a CD sitting on the window of a store front. Of course we took the opportunity to record a video for the song. This was thanks to the artist Floris Schönfeld, who was holding an exhibition at Survival Kit 8, a contemporary art fair. His work “A Brief History of the Damagomi Group”, aptly located in Pauls Stradiņš Medicine History Museum, evoked the atmosphere of the song in a wonderful way. The passing of the days and the progression of our treasured project facilitated our rapid sociological immersion in Latvia, much greater than we would have experienced as mere tourists. I hope I don’t seem arrogant if I say that I think I came to understand the soul of this town better. We lived through so many intense experiences there that it was very difficult to depart. Latvia not only filled the holes left behind by the CDs. It gave us so much more, a sense of belonging to a land that was not ours, an unswaying impression. Slovenska Televiza hope we have been able to leave a humble testimony of this journey. We left a part of ourselves there. You’re probably thinking that we must have wondered so many times about the destiny of each of those CDs. In case you’re curious, we haven’t received any news from anyone, no messages. Maybe it’s better that way. The first paragraph of this article originally appeared in Spanish on the website El Estado Mental. Translated by Gerard Ryan.